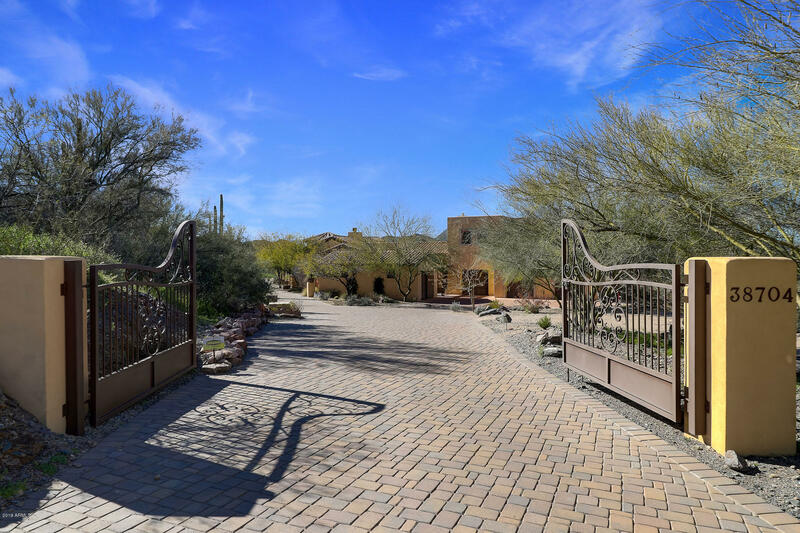 Outstanding Custom Home & Horse property nestled on 12.5 acres w/breathtaking Mountain Views, gated entry, paver driveway, & 4 car garage. Soaring ceilings, beautiful stone floors, arched windows, upgraded lighting, & beamed ceiling in foyer. Spacious open floor plan, double and single-sided fireplaces, & formal dining room w/French door to patio. The gourmet kitchen is incredible, high-end SS appliances, center island, breakfast bar, granite/travertine counters, secondary sink/prep area and custom cabinetry. Perfect Home for entertaining inside and out. The eat-in kitchen boasts charming fireplace & patio access. The wood doors, hardware, lighting, & floors are a must see! Sensational loft area with endless possibilities. Hardwood floors in all the right places & 2nd floor balcony access from game room. The exquisite Home offers a private Den built-in library, & guest quarters. Exercise/Game Room has it's own bathroom and plumbed for kitchen to make for a fabulous mother-in-law suite. Grand master is truly a retreat w/romantic fireplace, private patio, upscale carpet, vaulted ceiling, and spa-like en suite w/atrium. Custom walk-in closet. Every room is an adventure in great taste & style. There are 3 full bedroom suites with unique bathrooms! Enjoy the saltillo covered extended patio, multiple pergolas, sparkling pool, fire pit, subzero bar fridge in BBQ complex and unobstructed views. Professional snake proof fencing surrounding backyard. Home provides two areas that can be office/library/den both upstairs and down. Easily converted to an equestrian estate with zoning for up to 39 horses. Room for barns, paddocks, arenas, etc...just a few steps away from the sand filled wash trail system. There is an existing subpanel and water line for future barn/structures. Make this property your own personal getaway with a short walk to downtown. If you live here, you will love it here!